I am not going to describe what SQLMI are and how they compare to the other SQL offering on Azure here, but if you need to know more about MI this is a great starting place https://docs.microsoft.com/en-us/azure/sql-database/sql-database-managed-instance. Yet, this is a very viable and cool option to host databases in Azure. Configure Virtual Network where Managed Instance will be placed. Create Route table that will enable Managed Instance to communicate with Azure Management Service. Assign the Route table to the subnet. Double-check that you have not added something that might cause the problem. Vnet configuration is the network container for all your stuff, this said, the MI shall not be on a subnet that has anything else. And so, creating a subnet for all of your Mis makes sense. Also, there cannot be any Service Endpoints attached to the subnet either. If you want to have only one subnet in your Virtual Network (Virtual Network blade will enable you to define first subnet called default), you need to know that Managed Instance subnet can have between 16 and 256 addresses. Therefore, use subnet masks /28 to /24 when defining your subnet IP ranges for default subnet. If you know how many instances you will have make sure that you have at least 2 addresses per instance + 5 system addresses in the default subnet. The route table will allow the MI to talk to the Azure Management Service. This is required because Managed Instance is placed in your private Virtual Network, and if it cannot communicate with Azure service that manages it will become inaccessible. add new resource “Route table”, and once it is created for to Routes blade and add a route “0.0.0.0/0 Next Hop Internet route”. This route will enable Managed Instances that are placed in your Virtual Network to communicate to Azure Management Service that manages the instance. Without this, the Managed Instance cannot be deployed. There should be no Networks Security Groups in your subnet. There should be no service-endpoint in your subnet. There are no other resources in subnet. There should be no other resources in your Managed Instance subnet. And then what you ask? You need to connect and play for the database stuff? 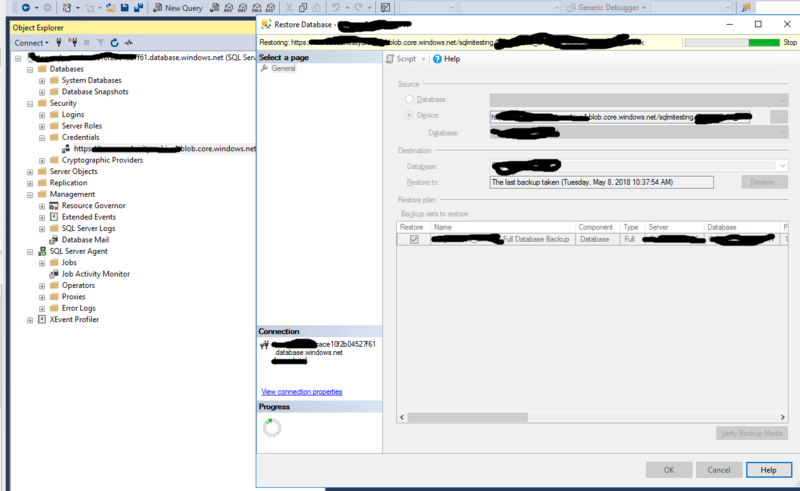 SQLMI are private by default and the easy way is to connect from a VM within the same Vnet, connect using SMSS or from your app running next to the SQLMI, like the usual architecture stuff right? But if you thought you could restore a DB from a backup (.bak) file you can, but it will have to be from a BLOB storage container of some sort as SQLMI can only understand that device type. Because SQLMI is managed and under SLA, all databases are fully logged with a throttling(https://blogs.msdn.microsoft.com/sqlcat/2018/07/20/storage-performance-best-practices-and-considerations-for-azure-sql-db-managed-instance-general-purpose/ ) to ensure the cluster can ship and replay the logs in a good amount of time. When doing more intensive operations such as insert millions of records this can play a role slowing this down. Tip! remember that the tempDB is not fully logged and lives on local SSD for the Business Critical version of SQLMI. Use this one if want untethered speed.